In June, Beijing raised the “administrative status of the Xisha, Zhongsha and Nansha islands” from a county-level administrative office to prefectural-level city named Sansha based on Woody (Yongxing) Island in the Paracels (Xisha) archipelago in the South China Sea. In July, the People’s Liberation Army (PLA) established a division-level garrison in the newly created city also based on Woody Island. Analysts and pundits have viewed the announcement of the new garrison with alarm. One analyst viewed the decision as “a sign of [China’s] growing reliance on hard power” in the South China Sea. Another commentator equated the announcement with a decision to create “a permanent forward-deployed military force within striking distance of such contested waters,” a view echoed by the New York Times. Still others suggested that a division of at least 6,000 soldiers would be deployed to the region and that the garrison might command units from the PLA Air Force and Navy. Such conclusions, however, are misplaced. In particular, they misunderstand the role of garrisons (jingbeiqu, also called garrison commands or garrison headquarters) in the PLA and how China has organized the defense of the islands and reefs it controls in the South China Sea. From a military perspective, the significance of Sansha garrison should not be overstated. Alone, it will not lead to an increase in combat units in the region nor does it portend a new effort by China to militarize the disputes in the South China Sea. In the PLA, division-level military garrisons do not command main force combat units such as infantry or armored divisions or brigades. They also do not command PLA Navy or PLA Air Force units. Instead, as described in China’s 2006 white paper on defense, garrisons and other division-level military sub-districts (junfenqu, also called prefectural military commands) are administrative headquarters established in major cities responsible for supporting the military work conducted by the municipality, such as conscription and national defense mobilization tasks. Garrisons and military sub-districts fall under provincial-level military districts (shengjunqu) and are jointly commanded by the municipality’s party committee and government. As with division-level units, they are headed by Army senior colonels, who are assisted by a handful of staff officers. Depending on their location, garrisons and military sub-districts may command PLA border defense units (up to regimental size) that share responsibility with civilian public security forces (gong’an budui) for guarding China’s borders and providing early warning of an attack. So far, no border defense units have been assigned to the Sansha garrison. Instead, the existing Xisha (Paracels) maritime garrison under the PLAN’s South Sea Fleet is responsible for the actual defense of the islands in the South China Sea under China’s control. 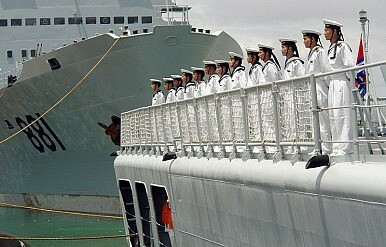 The Paracels maritime garrison is one of six division-level maritime garrisons (shuijingqu) that fall under the command of one of the three regional fleets in the PLA Navy. Maritime garrisons are responsible for conducting defensive operations (fangwei zuozhan) in their designated area and may command PLAN combat units.